In my art, I am interested in exploring the intersection between art, science and spirituality. I feel all these philosophies are a framework through which we as human beings attempt to understand our universe and our place in it. My art at once, evokes an alien and ancient form combined with a hybrid of plant, animal, and human forms. The movement and repetition in the drawings evoke fractal like structures that are abundant in nature. Evolution is alluded to in the work as each form is an organic hybrid of various forms of life, depicted in a state of transformation and metamorphosis. The ultimate result reflects the evolutionary process of beginning with the simplest, one celled organism evolving into the various complex expressions of life. Judit Csotsits was born in Hungary and currently lives in Los Angeles. She earned her BA from the University of CA, Los Angeles and MFA from Otis college of Arts and Design. Using surrealism, and mixed media, Judit’s work is strongly influenced by the ornate architecture of Eastern Europe. Her painting is created using simple symmetric structures in an attempt to understand the intersection between art, science and spirituality to understand an individual’s place in the Universe. Her current work is a combination of pen, ink, acrylic and colored pencil on Mylar. The drawings are created intuitively using only a simple symmetric structure from which lines and form grows. 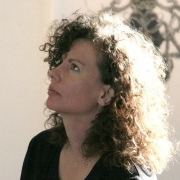 Judit has had several exhibitions in the United States in galleries such as Shoshona Wayne Gallery (Santa Monica) and Sylvia White Gallery (California). She has also had an art show at the Vivarosi Gallery in Hungary and featured in publications such as Studio Visit and Complementary Visions.